The current debt is $16 trillion. If each American wrote a check for $51,100, the debt would be erased. And it would be even cooler if they used popular checks design from Bradford Exchange! Since that’s not going to happen, we need to come up with another solution. The IRS would be thrilled if Americans started by paying the $350 billion in back taxes we owe, but that would hardly put a dent in this overall figure. The debt is growing at about an 8% rate each year, which is not good news for anyone. The mere interest on this debt each year is an amazing 6% of the federal budget. We will soon get to a point where we are merely paying the interest on the debt never touching the principal. At the core of the problem is this vicious cycle: the government continues to sell treasury bonds to raise the money it needs to pay its bills, or at least the interest on the debt. Because the Chinese are buying lots of those bonds, they have come to “own” a large fraction of our economy. Not only are they buying U.S. assets, but we are then buying their products with borrowed money. The government does not have the option of declaring bankruptcy, so it either borrows more money or prints more money to meet its obligations. If the government is not careful to limit its printing of money, inflation will crush the U.S. economy again. Any percentage point upward in the inflation rate hurts your purchasing power and the value of your savings and investments, because your dollars instantly become worth less than they were the day before. Consumers are also hurt by the debt because prices are higher for almost everything a person buys, due to weakened confidence abroad in the strength of the dollar and the U.S. economy. Need an example? Go fill up your gas tank. You have quietly accepted a doubling of your gas prices in recent years because OPEC has charged more for its oil in light of less confidence in the dollar. 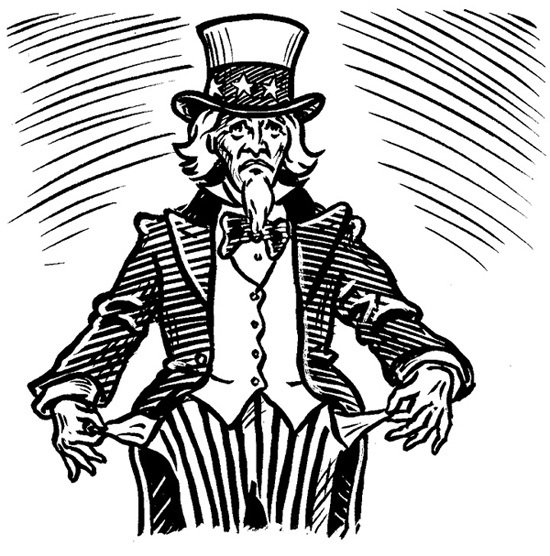 The government debt especially threatens vital accounts such as Medicare and Social Security. Most economists predict that Americans will have to either accept reduced benefits or be willing to pay much higher taxes, or both—a true squeeze play. The debt has been aggravated by government bailout of banks. In 2009, for instance, the government threw $700 billion at the banks to keep many of them in business, money that the government absolutely did not have. Letting those banks fail, however, would have created other problems, including the loss of billions in savings and investment by Joe Average Consumer. This quandary is typical of the harsh choices that the government has to constantly make to keep the economy afloat and the debt bubble from bursting. Many economists view the end game to this debt problem as resulting in one of two conditions, neither BTW is palatable to the average American. The government can either: a) stop printing money and allow interest rates to rise, this would make borrowing more expensive than it is today and likely bring the economy to a halt. Or, b) keep printing money to delay the harsh consequences of the debt, (kick the can further down the road) which will create continual inflation to the point where the dollar could end up having little value at all. Pick your poison! In simple terms, either your personal debt will mushroom (raising interest rates) or your paycheck will be worth far less (continual money printing). The only way to avoid either end of this double jeopardy, would be for the economy to grow at a robust pace and for all Americans to accept higher taxes and fewer social programs. Sounds like our friends in Washington need to agree to do what is best for the whole of the country, not just their perceived political constituents. Keep in mind, our economy is a consumption based economy, something many of us in the financial blogosphere have little stomach for. I wish our government would get their act together, but with a two party system, I don’t see them coming to a compromise soon. For sure, one side will have to come to the “center” a bit to get anything done, I think in order for that we need a new leader who can work with both sides, not the far left of one side! Great post, Jim. I can’t see anything changing until those spending the govt money grasp the importance of living within our means, which I’m not sure will ever happen. That would mean that responsibility would have to overcome greed. For sure Laurie, I think we need to plan our lives as if this will never happen and prepare ourselves for the worst. I hate to say that, I am not a negative person, just fear that it is the reality of the situation! Thanks so much John, love doing it! Makes me sad to see what’s becoming of our country. We have the smartest talent in the world, the greatest universities, the greatest companies – now if Congress could just get its act together. Here Here!! They go to DC to represent the people in their districts and states, but once they get there, they end up representing the lobbyists and the special interests! Pitiful!